A steep drop in sales has left Adidas behind not just longtime rival Nike Inc. in the U.S. but behind relative newcomer Under Armour Inc., as the German sportswear company falls into third place. Facing stiff competition here, the company recently shuffled its U.S.-based leadership, elevating Mark King to helm Adidas North America from his position as chief executive of subsidiary TaylorMade-Adidas Golf. Mr. King, 54 years old, relocated from California to the group’s Portland, Ore., regional headquarters. From there, he oversees the Adidas Group operations that also includes the Reebok and CCM brands. Mr. King spoke with the WSJ this week about the challenges Adidas faces in the U.S. and its strategy for getting past them. Here are some edited excerpts. I was in golf my entire life, for the last 15 years with the Adidas Group because they owned the company. I would say at my core I’m more of a sports guy than just a golf guy, I just ended up in golf. So when they asked me to do this, it was very exciting for me. The size of the job is very broad: the Adidas brand, the Reebok brand, the CCM brand, and Canada— we have a pretty big Canadian business out of Toronto—we have the sports licensing division out of Indianapolis. So where I once had this little place in southern California, now I’m all over the country. How did you come up to the position you have now? What sorts of conversations did you have with headquarters in Germany? When [Swede] Patrik Nilsson, who had the job before me, moved on to be with his family, they were really looking for a few things. One is, they wanted an American. The number one thing on my resume wasn’t that I was smart or educated; it was that I was an American. Because I think, as great as the Adidas business and brand is around the world, it obviously isn’t as strong here as it is in other parts of the world, and one of the beliefs is that we aren’t Americanized. There’s a bunch of things. The first is I think we do have to create a lens, and the lens is the American mindset, the American culture, the American nuance, and we look at the American lens, not a global lens. So, it’s having American people in key commercial jobs, so the design people may be more connected to the American culture, better understanding, then, of American sports. So we’re not relevant today in football, baseball—we are in basketball, but not in football or baseball. So I think one of the things we’re looking at is, how do we become more a part of American sport? And then the third thing is the organization is very structured, and the speed of the company is very controlled. And I think the pace in America is a little more chaotic, a little more hectic, and a little more fast-paced, and we need to bring some of that to how we operate. Footwear is a majority part of Adidas’ business, and your retail footwear sales here have declined 24% so far this year. How do you improve that? Hmm, sell more? [laughs] I think the styling has to be more relevant. The styling, the design, has to resonate more with American consumers. So the company is moving the global head of design to Portland, so that the head of design lives in America. And he’s also an American. That will happen this fall. Data shows that Adidas has fallen behind Under Armour and Nike in retail sales in the U.S. so far this year, a first. Are you surprised by that, and what does that mean for your role and for the Adidas company? It doesn’t surprise me. Is it disappointing? Extremely. But is it surprising? Not that surprising. And what does it mean? It means we have to look at the way we do business and commit to making real changes in the way we create products, the way we bring them to market, the speed at which we bring them to market. With the exception of a couple seasons — back to school and Christmas — with the exception of those two seasons, consumers buy when they want to buy something, and our system is really fall-winter and spring-summer. I think that has to change dramatically. What is your relationship with wholesale distributors here, and have your retail sales affected that? I’d say to be honest with you, the challenges we’ve had at sell-through right now, the conversations with our retail partners has been very positive. It hasn’t been positive about what’s been happening in the last year, but it’s been very positive about, hey, we need to work with you, to make these changes together. We have to better satisfy their consumers in their different banners. And we’ve been dealing with each banner the same way and really it’s a consumer business model that deals with a different consumer group at more of these different retail chains— the price points, women’s, kids, and we haven’t looked at the business in exactly that way. It’s not completely different but the nuance is different and it has to change. So in other words, more specialization? 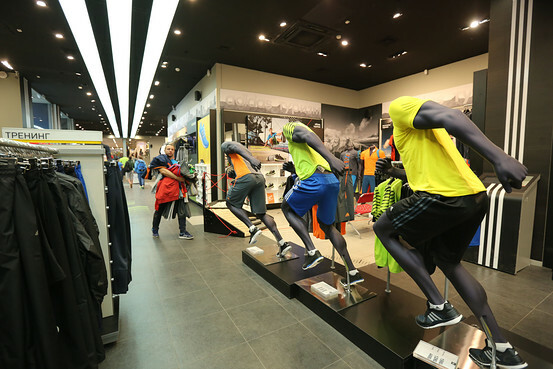 What about between lifestyle sportswear and performance sportswear? One of the things we’d like to see is there’s a real delineation between style and performance, and we want to see those come together. The consumer isn’t delineating between style and performance, it’s become one thing. That will be a competitive advantage for us, along with innovation. A lot of sporting goods executives use the word ‘innovation’ when describing their objectives. What does that mean? I think it means leading change. I think innovation only means leading change. The reason you hear it a lot in sporting goods is if there wasn’t that innovation, then it would be a commodity business. And in a commodity business, prices fall, but if you have new innovation, that means—and it could be materials, it could be style, it could be fabrication, it could be light shoes, which used to be 14 or 15 ounces and now they’re 9 or 10 ounces. Those things give consumers a reason to buy.